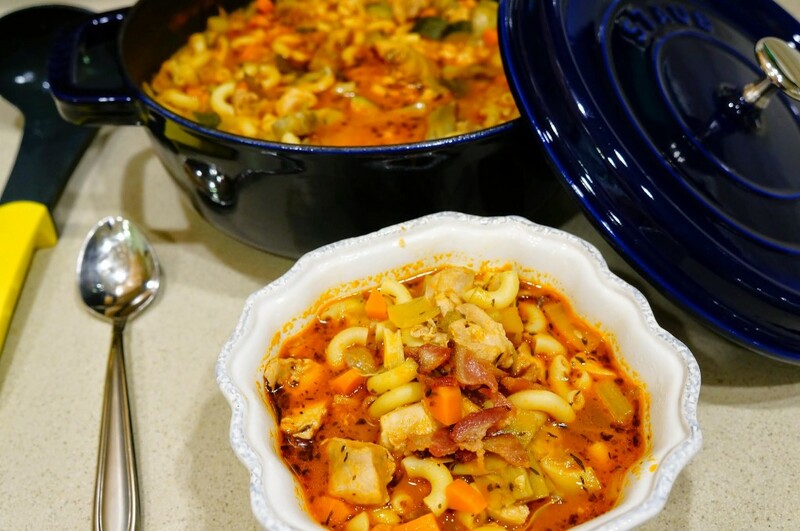 You can’t go wrong with a hearty bowl of soup. A warm and full belly after a perfect bowl of soup is one of my happy places! I always keep raw chicken breast in my freezer. It’s such a universal meat that you can eat with just about anything, sandwiches, pasta, soup, grilled, stuffed, stir-fry; choices are endless! This is one of those recipes that calls for chicken. It’s also one of those recipes that’s perfect for when you need to clean out the fridge. Lots of veggies leftover that are going back, just throw them into the soup. By the way, this recipe gets better. 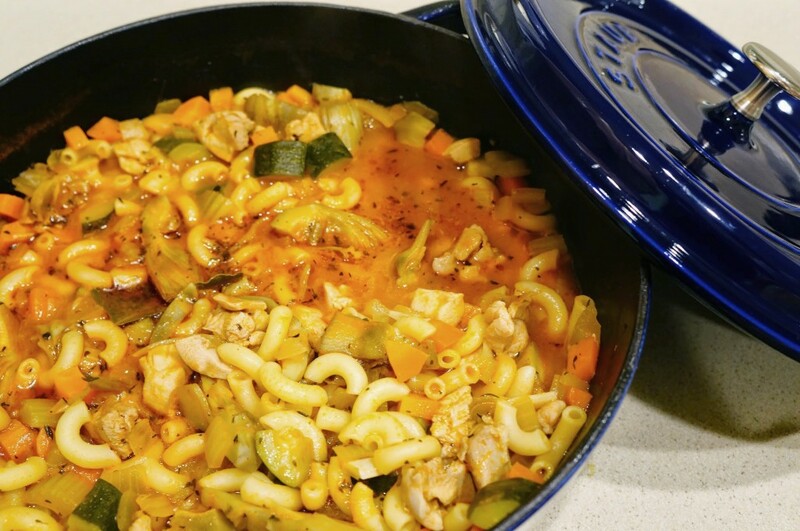 It’s a one pot dinner, made in prepared and cooked in under 30 minutes. Best. Decision. Ever. When I’m making this recipe for dinner, it gives me motivation to get through the day, something to look forward to when I get home. No judgement. You know you do the same thing. When there’s a tasty meal at home, you’re ready to finish work and get on home! Food is my motivation! I dedicate this dear recipe to my friend, Judy Lu. She made this yummy dish for dinner, and I emailed her the day after for the recipe. Honestly, so delicious! 1. Cook the bacon until crispy. Set bacon aside to cool and then break into small pieces. This will be used to garnish. 2. Add some olive oil to the bacon grease, and then add the veggies (onions, garlic, carrots and celery) and 1 teaspoon of salt and 1 teaspoon of pepper. This is where you can add your extra, leftover veggies while you’re at it. Cook until the onions are translucent. 3. Add the chicken stock, basil, thyme, bay leaves, and tomato paste. Stir until combined. 4. Add the cubed chicken pieces and make sure it’s submerged into the stock. Let it boil, and then reduce to medium heat. 5. Add the frozen artichokes and the elbow macaroni. Simmer for 20 minutes until pasta is the way you like it. Be sure to check that the chicken stock does not completely evaporate. Add more stock if needed. 6. Season with salt and pepper. Ladle the spezzatino into bowls and garnish with pieces of bacon. ^^^ I threw in some zucchini too! I love that dinner can be this easy. Getting home at 6:30 and dinner on the table by 7:30pm. It doesn’t get easier unless you buy Panda, right? What do you think? 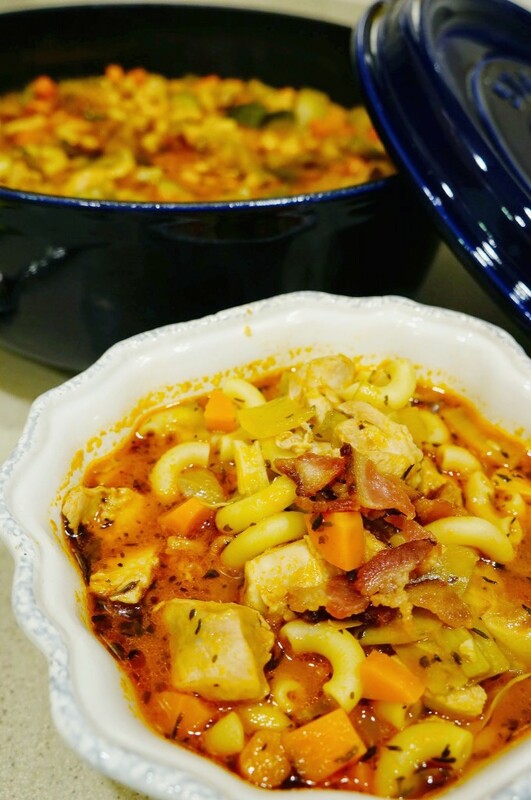 What are some of your favorite on pot recipes? 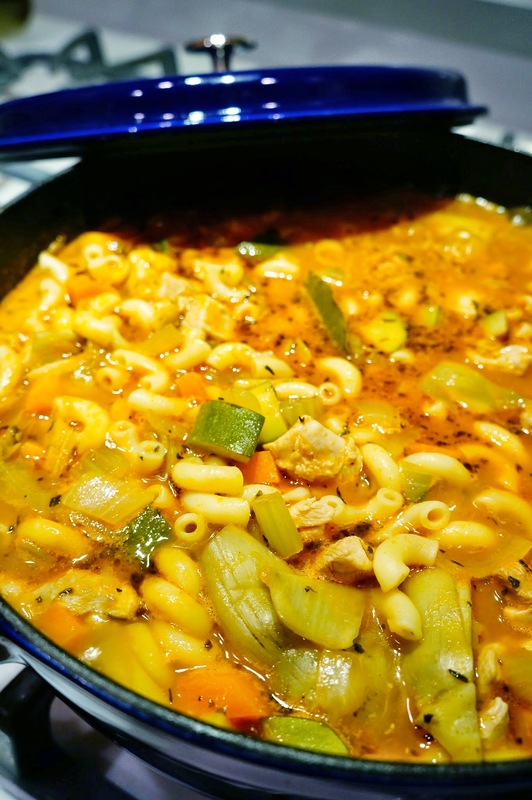 This entry was posted in Food & Recipes and tagged chicken, dinner, elbow macaroni, food, ideas, one pot, recipes, spezzatino. Bookmark the permalink.